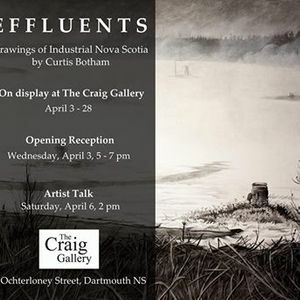 Join us for the opening reception of Curtis Botham's showing of a series of drawings called "Effuents". 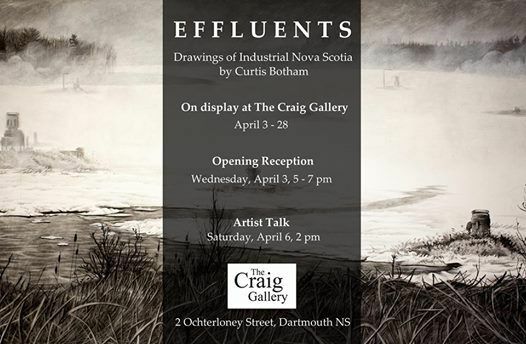 "Effluents is a series of large-scale charcoal drawings which Curtis created during his year-long artist residency in New Glasgow. Focusing specifically on coal, lumber and steel, this exhibition documents the various industries and their impact on local environments and communities. Factories, generating stations, and mills dominate Curtis’ landscapes, showing how natural resources are transformed into commodities. These modern industrial landscapes are balanced with drawn reproductions of historic photographs and slogans from years of newspaper headlines and political slogans. Effluents depicts a tug-of-war between environment and economy, and how anxieties around these polarizing issues have brought our society to an important crossroads. Curtis Botham’s latest art series has won him the 2011 Canada Games Young Artist of Excellence Award. It will be on display at The Craig Gallery throughout April. Curtis will be giving an artist talk on Saturday, April 6 at 2pm."